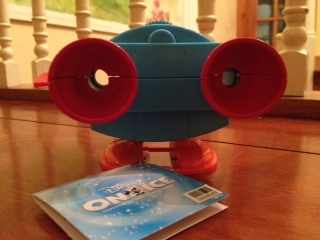 Today we have two versions of Lenny from the Toy Story films! Lenny has never been released in the official Toy Story line, so in getting the character, you basically have these two main "round about" options. The first is the Toy Story on Ice Lenny. 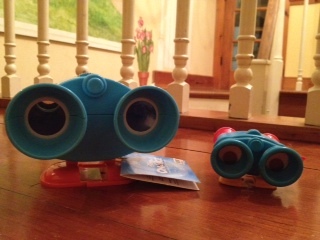 He's a bit larger than in the movie, but is still to pretty good scale and he actually works as binoculars (though he is not a windup toy and does not walk). He's apparently extremely rare and rarely appears on eBay (and when he does he an sell for well over $100). I don't know why he's so hard to find though! I just went to Disney On Ice near me a few months back and they had a TON there. That's where I got him and he was about $10. The second one out there is actually just a Burger King kids meal toy from 1996. He's great though! He's not very hard to find and sells for about $15 or less on eBay. I got this very one in a kids meal back when they were selling at BK in '96. I remember I was hoping I would get him as the prize that day so I could get a Lenny in my collection! And it just so happened that I did. He's a little small compared to the movie (so I think a perfectly scaled Lenny would be somewhere in between these two) but is a good representation of him. He winds up, walks like he does in the movie and his eyes bounce while he moves (video example below-sorry that it goes sideways). 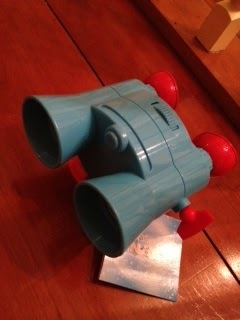 He does not work as real binoculars like the "On Ice" one does. The bottom line is that they are both good for different reasons. They both have their pros and cons. If you can, try to pick up one of each if you can't decide! UPDATE: In addition to the two I have here, there was a Lenny that was released in the Toy Story and Beyond collection (seen here) that I don't own. His size is between the "On Ice" and the "Burger King" versions. 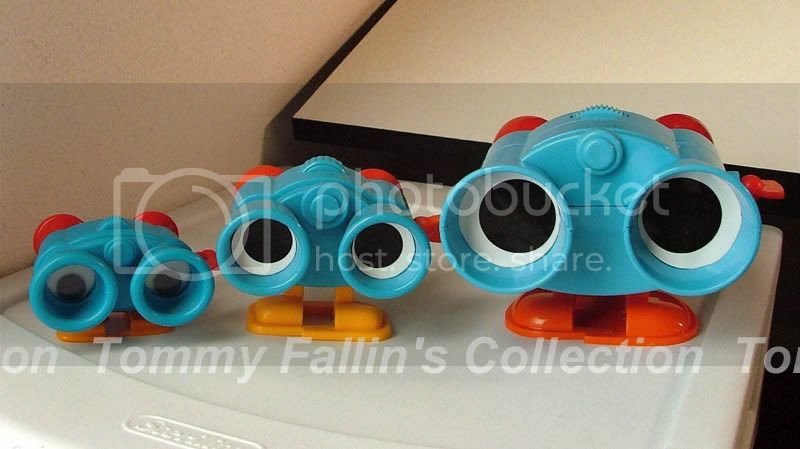 A picture comparison of all three can be seen here on the Pixar Planet Forums. Here is the Disney/Pixar "Greatest" soundtrack! It's a really fun collection of many of the classic and memorable songs/scores found throughout the films from Toy Story through Up (since it was was released in 2009 right before Up was released). If you have all the soundtracks, there is really no need for this. There are no exclusive or "lost" tracks here. But if you don't have all the soundtracks and just 25 of the best, this album is for you! Today's post is another relatively new re-release from the Radiator Springs Classic collection exclusive to Toys R Us...Radiator Springs Lightning Mcqueen! He has been released MANY times since 2006 and is not a hard one to track down. This Mcqueen is seen in the last scene of the film when he comes back to Radiator Springs and visits with Sally by the Wheel Well Motel (see screen shot above). Here's another slideshow from our trip to Disney Land and California Adventure this past April 2013! Even though it was meant more for younger kids, we loved A Bug's land! We loved all the detail and how it really captured the feeling of the movie. I loved searching the area for every main character (as there were sculptures placed all around-you'll see in the pictures. The only one that I couldn't find represented was Princess Atta!) and had a surprising fun time on Heimlich's Chew Chew train haha! It's Tough to be a Bug is a classic show we still enjoy and I loved the miniature (or rather full size) ant island while waiting in line there! The Monsters Inc Ride, Mike and Sulley to the Rescue, was also great fun! I loved how well Pixar was represented there at DCA. It was such an amazing trip...we can't wait for Disney World FL 2014. 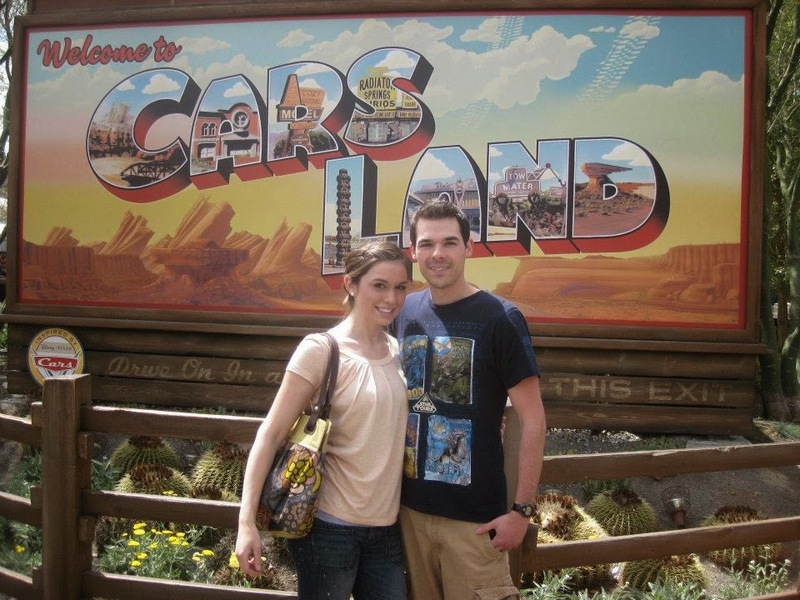 Here's a slideshow I pit together of our trip to Cars Land this past April 2013. We had such an amazing time there and at all of Disney Land and California Adventure that week. 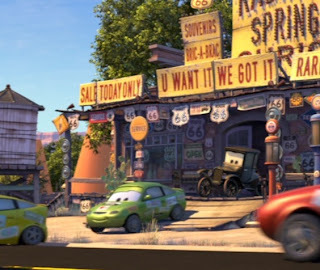 The amount of detail there at Cars Land (like all of the Disney attractions) is incredible and it felt like you were really visiting Radiator Springs straight from Cars! 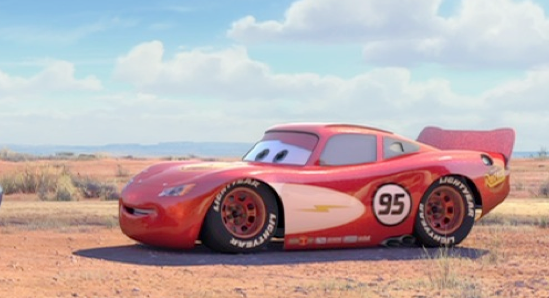 In the original Cars, Lightning Mcqueen has a dream (well, nightmare), about Chick Hicks winning the Piston Cup and becoming the new face of Dinoco- blue paint job and all. We have hear a new, but technically old car. This is a new re-release of Dinoco Chick Hicks found only at Toys R Us and part of the Radiator Springs Classic collection. He has been released multiple times since the original "Desert" series and this is the latest. If you missed this one before, now's your chance to snag it for your collection! Here is Darrell Cartrip with Headset from Cars 2! He is seen in both Cars films but this diecast is specific to his appearance as a World Grand Prix commentator. You can spot him just right before the Tokyo race (screen shot above). This is a Mattel 1:55 scale diecast. He's pretty new and you should be still able to spot him in stores! Found mine at Target so go check around if you're still on the hunt for him. 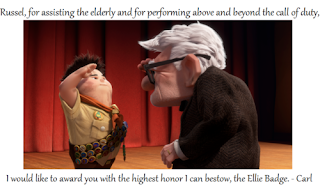 Today I present a meaningful Pixar Collectible..."The Ellie Badge" replica pin from Up! I love what the badge represents and was big part of some of the most touching scenes in the the movie. 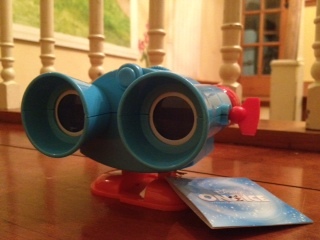 There are not a whole lot of Up collectibles out there compared to some of the other Pixar films, so when I saw this, I jumped at the chance to get it (plus I love when items from Pixar films become available). This particular pin with this collectible box was exclusive to Disney Movie Rewards when the film was just being released on Blu -Ray and DVD. You can still find it on Ebay periodically and sells between $20-$55. The pins themselves are easily found though and for much cheaper on Ebay and in the Disney Parks-just without this box. They are on just a standard Disney Pins black backing. They sell for about $10-$12. 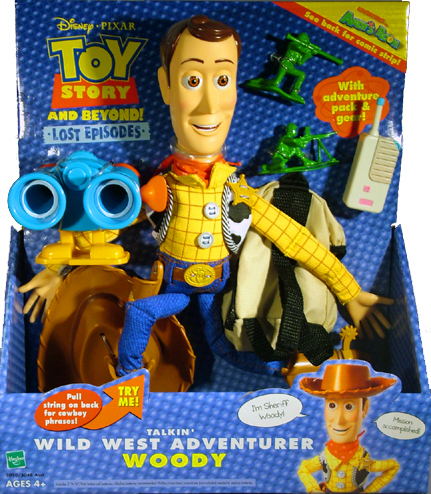 Good luck on the hunt-this is a must have for any Pixar fan! Today I was given the opportunity to answer some questions about my love for Pixar! Al of Pixarcorner.blogspot.com (which is a great blog by the way) contacted me seeing if I was willing to participate in his weekly interview called the "Luxo Limelight." Of course I jumped at the chance and I'm now featured in Issue #8! So head over there to learn even more about me as a Pixar fan and what it means to me! 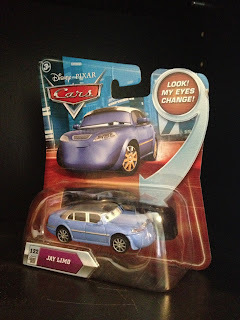 One of the latest Cars 2 diecasts! In the film, Franca is found in the Italian Festival scene (where Mcqueen talks to Mama and Uncle Topolino). 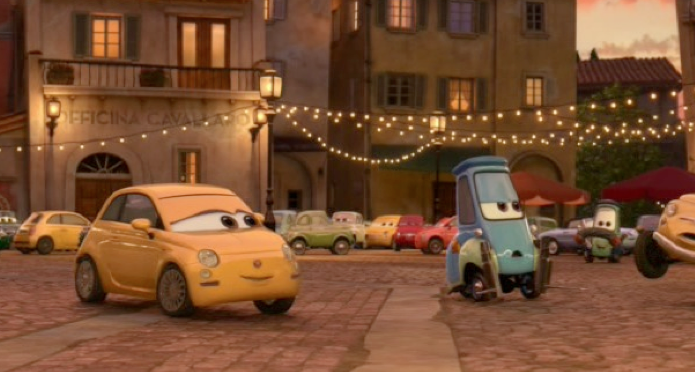 She ends up being Luigi's dance partner while Francesca (the blue car of the same style, also just released as a "chase" diecast, dances with Guido. If you haven't found her yet, keep a look out! I still see her now and then. Years ago (right around summer 2011), I saw this amazing art piece as someone's avatar on a Pixar site fan forum. I had no idea if it was fan made or an official piece of Disney·Pixar art. I also had no idea who the name of the artist was and no idea what the name of the print was called. It just said "Danny" in the corner. It was many months later of searching that I finally came an image on Google and it led me to a page with official info! It turned out to be a pretty limited (1000 reproductions made) and official Disney Fine Art print by Pixar character artist/set designer Daniel Arriaga! It's called "The Pixar Storyline." A certificate of authenticity was included. Because of the price, I never expected to get it, but Christmas 2011 I got a HUGE surprise from my wife (then fiance) Brita! 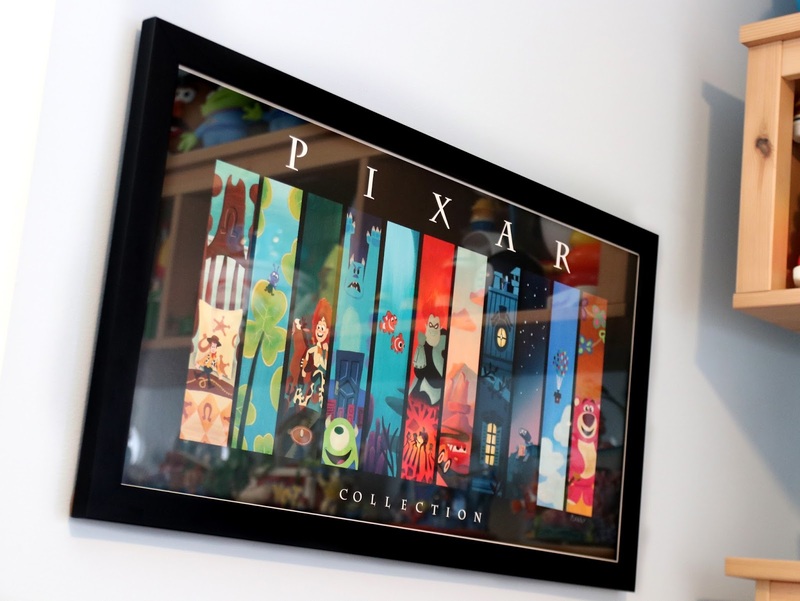 I was SO excited and to this day it's still my favorite piece of Pixar art I've seen representing each of the first 11 movies. I just love the minimal style, the colors and designs. The feel of each film is captured perfectly. It's not framed yet but it will looks even cooler once it is! Today we have a brand new re-release of Donna Pits! She was originally released in the "Final Lap" series. 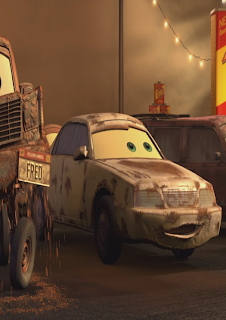 She is seen in the first Cars movie inside the Rust-ezes sponsor tent (next to Fred...screenshot above). 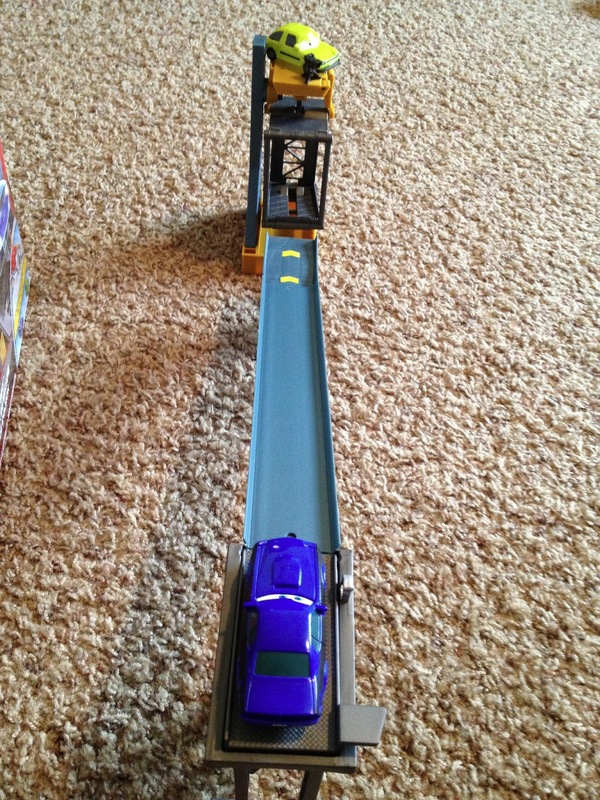 Here is the Cars 2 "Stunt Ramp Getaway" track set from Mattel! There are five other track sets total (Tokyo Spinout, Cliffside Challenge, Spy Jet Escape, Barrel Blowout and Big Bentley Breakout) and they all connect to create a fun chain reaction! Once I post about each set, I will do a final post with all of them together. This set comes with two cars (plastic, not diecast but this set is meant to also use with the diecast collection): Rod Torque Redline and Acer. Acer is more of an accessory though. He's hollow and is used mainly for launching off the platform as Rod jumps through. 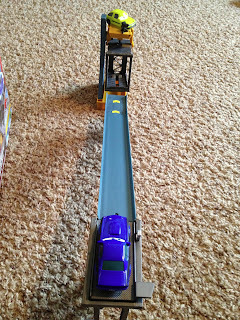 And here is the assembled track (just take about five mins) and a brief video showing it in action! Here is a fun Blu Ray...Mater's Tall Tales! A great addition to the Cars world for any of you Cars fans. 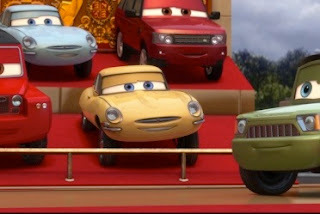 I really love how Pixar has been doing the "Toons" (Cars Toons, Toy Story Toons and hopefully they'll start doing MU or MI Toons!) to continue the stories of well loved characters without having to make another full length film. This Blu Ray includes 9 short films (see below for which ones) with 2 being new and exclusive to this set. There are two other Cars Toons currently out there not included here. 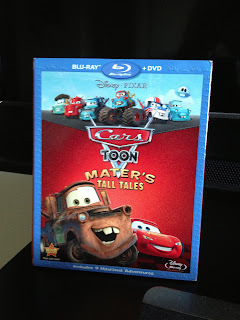 There is (my personal favorite) "Time Travel Mater" (which can be found on the Pixar Shorts Volume 2 Blu Ray) and also "Air Mater" (which can be found on the Cars 2 Blu Ray). Fun Fact: He is named after Pixar animator Victor Navone! Here is Nick Sticker from the original Cars! He was seen briefly in the end credits epilogue (screen shot above). This Nick Stickers is a re-release and is part of the Toys R Us exclusive "Radiator Springs Classic" collection. The Original release was part of the "Final Lap" collection. Today we have the Finn McMissile with Karate wheels from the "Quick Changers" line! The Quick Changer cars is a series of plastic (not diecast) cars that "change" as you press a button on the back of the car. 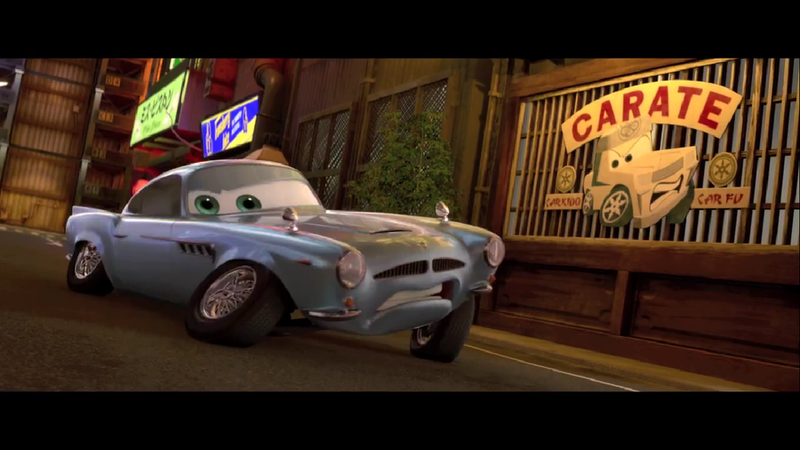 With this Finn, his tires and eyes slant to give the effect of a "karate" pose as seen in Cars 2 (screen shot above). I have not collected all the quick changers cars but just some that stood out to me. 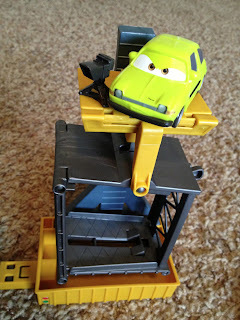 The quick changers line also has some other cool sets such as the Oil Rig Playset (see my post about that in the Cars tag or July 2013 archive) and Crabby the boat (from Cars 2). Today we have Jay Limo from Cars (obviously a parody of Jay Leno). 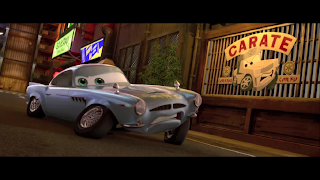 The car is seen on his talk show during the montage when Lightning goes missing. 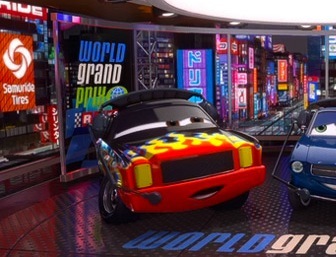 Jay says "I don't know what's harder to find; Lightning McQueen or a crew chief who'll work with him!" (screen shot above). This version of Jay Limo is part of Lenticular eyes series and is number 122. 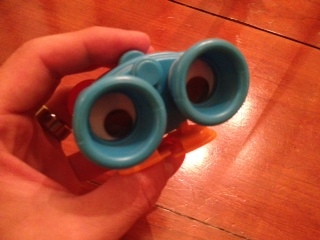 He was also released with fixed eyes in the Final Lap series. Although this version of the character is called "Hydraulic" Ramone, his hydraulics are not actually extended.